Stay active and on your feet! Improve your strength, flexibility, balance, and mobility. Get your copy of Easy Exercises for Balance and Mobility today! Improve Your Balance and Reduce Your Risk of Falling! Your chance of falling increases with age. Losing your sense of balance for a moment or taking a quick stumble is all it takes for you to end up injured, at the doctor’s office or in the hospital. But falls are not inevitable. You can prevent falls and enjoy your independence, long into your senior years. Introducing Easy Exercises for Balance & Mobility. This report from the geriatric experts at UCLA’s David Geffen School of Medicine will keep you active and moving and diminish your fear of taking a fall. Easy Exercises for Balance and Mobility is filled with more than 40 exercises and activities you can do at home to improve strength, flexibility, balance, and mobility. As you age, there’s no reason why you should have to give up life’s simple joys just because you are getting older. Staying active is the best prescription for staying healthy. Walk in the woods on a crisp fall day. Play with your grand kids. Feel comfortable and secure, alone in your home. Get out and shop for groceries by yourself or with a friend. Myth #1: If I limit my activity, I won’t fall. Fact: Physical activity will increase your strength and range of motion, making you more independent. Myth #2: Using a cane or walker will make me more dependent. Fact: Canes and walkers help people maintain or even improve mobility and stability. With improved mobility comes greater independence. Myth #3: I’m too old to exercise. Fact: The British Medical Journal found that simple exercises improved the strength, function, and participation in daily life among people 70 and over. Myth #4: Taking medication won’t increase my risk of falling. Fact: Medications may increase your risk of falling by making you sleepy or dizzy. Myth #5: There is no need to get my vision checked every year. Fact: People with vision problems are twice as likely to fall as those without an impairment. Get your eyes checked every year and update your glasses, if necessary. Debunk these myths and get the facts in Easy Exercises for Balance and Mobility! You don’t have to slow down or sit down! Easy Exercises for Balance and Mobility will help you make a plan and put it into action. You’ll get dozens of easy and fun exercises and activities designed to make immediate improvements in the way you move and get around. The report also details changes to make in your home to help eliminate hazards. And how diet and medications affect your balance. Build up important muscles. Improve your flexibility. Develop a better sense of balance. Remain active and maintain your independence at any age. 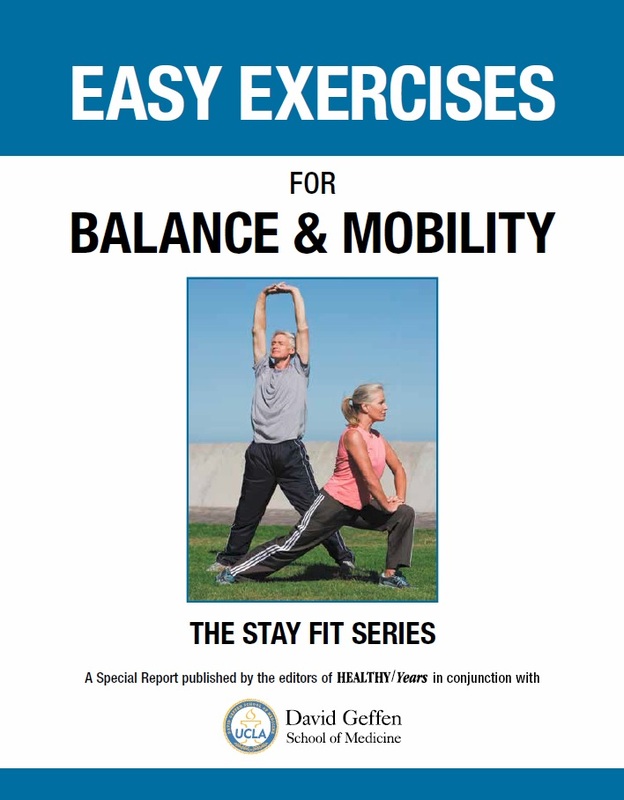 Get your copy of Easy Exercises for Balance and Mobility today!